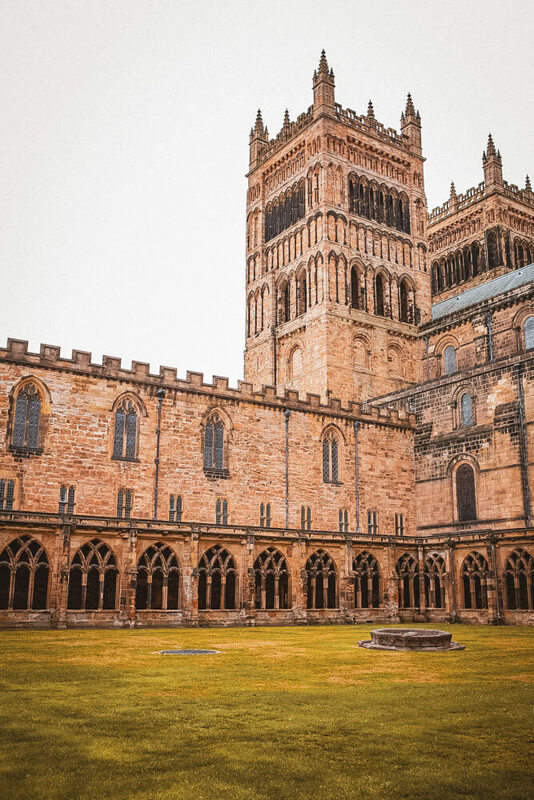 Curious about the connection between Durham Cathedral and Harry Potter? This post covers everything you need to know about which of the HP movies/scenes filmed here, along with fun facts about production! As most superfans know, in the magical world of Harry Potter, a number of real-life locations were expertly strung together to create the most sought-after learning institution of all time: the Hogwarts School of Witchcraft and Wizardry. But of all the real life stand-ins for Hogwarts, Durham Cathedral may just be the most extreme. After all, it was Durham University that rolled out the 1st university course in the UK to focus on Harry Potter. And who can forget their Harry Potter movie nights where people are encouraged to dress up like their favourite characters? Long story short, Durham and its majestic cathedral are a must-visit for any Harry Potter addict. So, if you’re wondering what Harry Potter scenes shot at Durham Cathedral, which parts of the Cathedral were used for filming or even how you can plan a visit for yourself, read on. 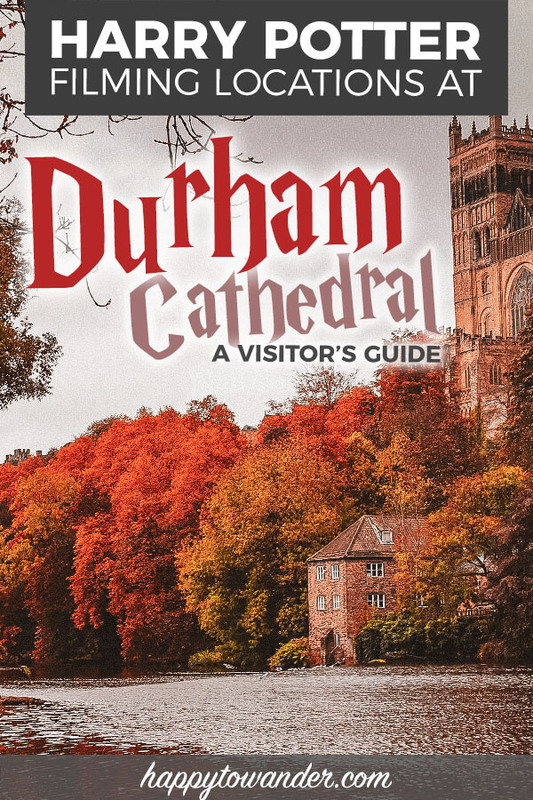 This guide will tell you everything you need to know about the Durham Cathedral and Harry Potter connection. Even before Harry Potter, Durham Cathedral enjoyed fame as one of the most beloved and visited cathedrals in all of England. Located in the Northeastern part of the country, this cathedral has an expansive history dating back to 1093, with visitors flocking over the centuries to witness its stunning Romanesque architecture and magnificent stone vaulted ceiling. It’s no wonder then that the Production Designers for the Harry Potter films scouted it to play the role of Hogwarts in the first two Harry Potter films: notably as the Hogwarts “Quad” and courtyard. Well, according to Harry Potter: Magical Places from the Films, much of it has to do with the building’s age. When conceptualizing the “look” of Hogwarts, their first consideration was the 1000+ year history of Hogwarts Castle. Since there are very few architectural styles that date back, well, ten centuries, they began to take inspiration from the two oldest schools in the English-speaking world: Oxford and Cambridge, then turned to some of the most famous cathedrals in England, like Durham and Lacock Abbey. Since building the entire castle as a set was impractical for the first two films (after all, they had no idea if they would be making all 8 films at the time! ), they decided to shoot on location. This lent the first few films a sense of authenticity and detail that would go on to inspire more realistic set pieces as filming went on, from the paint finishes to the weather and erosion on the buildings! For Harry Potter and the Philospher’s Stone, filming at Durham Cathedral took place for 2 weeks in October of the year 2000. Fun fact: they initially wanted to film at Canterbury Cathedral, but church officials said no because of the series’ “pagan themes”. In 2001, (the year they filmed Chamber of Secrets), Durham Cathedral was voted Britain’s favourite building. That year of course, the crew returned to film additional scenes on location, including a few notable ones like Ron’s slug spell going wrong. I’ll have a full list of scenes for you below though! Durham Cathedral is open every day of the year for visitors. There’s no entry fee, but a donation is encouraged and welcome. By public transport, you could commute to Durham Station (about 3 hours from London or 2 hours from Edinburgh) and then catch the Hop on Hop off Cathedral Bus which takes you from the main train stations over to the Cathedral. Alternatively, driving might be a more convenient option. There are no parking spots at the Cathedral itself, but they offer a few different Park and Ride options where you can park for free then catch a bus into the city/to the Cathedral. Click here for more details. Can’t you imagine all the Hogwarts kids scurrying around? 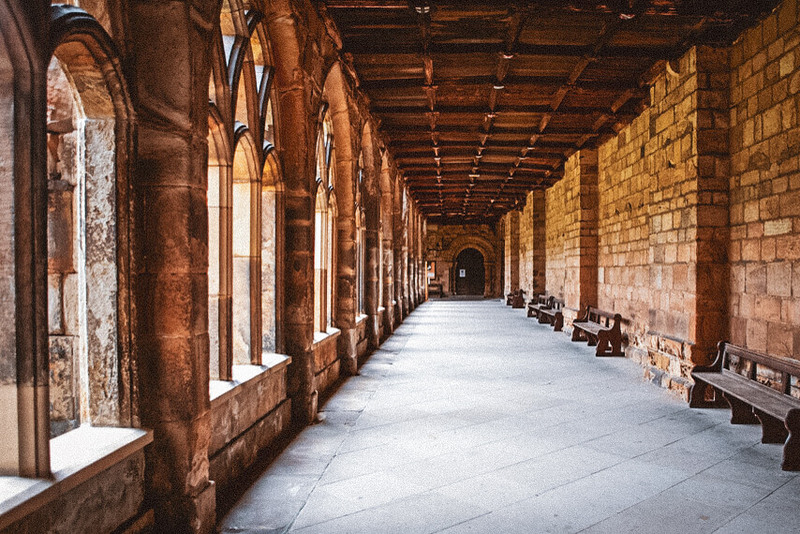 The Durham Cathedral cloister is seen multiple times throughout the films as the Hogwarts Quadrangle, or the outdoor corridors that students seem to pass through when they’re between classes. A lot of random scenes were filmed in the cloister and courtyard, but my personal favourite is in Chamber of Secrets, when Ron’s gallant act of (attempted) chivalry results in him puking up slugs. Very attractive. The second Durham Cathedral location used in the Harry Potter films is the Chapter House, which served as the setting for Hogwarts’ Transfiguration class. It makes its first appearance in The Philosopher’s Stone, then again in Chamber of Secrets with considerably grander decor. You might remember it better as the place where McGonagall explains the Chamber of Secrets to an over-eager Hermione, or where she’s teaching everyone how to turn animals into goblets (which tbh sounds really gross but what do I know)? NOTE: The Chapter House isn’t usually open to the public so visiting it isn’t as simple as just visiting the Cathedral. Visiting seems to be restricted to group tours and come at an additional cost. Click here for more information. This old photo shows just how little the room has changed though! Look familiar? Durham Cathedral got a magical, snowy makeover in Harry Potter and the Philosopher’s Stone in this scene where Harry lets Hedwig go, and the seasons magically change. This is probably the scene where you see the cathedral best, albeit with some lovely castle-esque CGI additions. I love this scene from Chamber of Secrets for a lot of reasons. Firstly, it looks like the Gryffindor and Slytherin Quidditch teams are about to challenge each other to a dance-off. Also, the dramatic reveal of Malfoy as the new Slytherin seeker is way too much… and well, Ron’s chivalry gets him puking slugs in the end. It’s all just a wonderful scene, set in the beautiful green courtyard of Durham Cathedral, with the cloisters making an appearance as well. 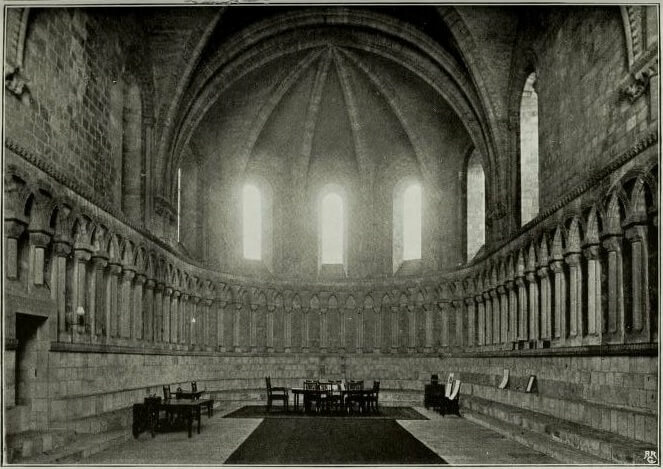 As we saw in the first film, Durham Cathedral’s Chapter House is the filming location of the Hogwarts Transfiguration classroom. I way prefer the look of this room in Harry Potter and the Chamber of Secrets though, where it debuts a much grander redesign. Most notably, you’ll recognize it in the scene when McGonagall is teaching the students how to turn animals into goblets, and then Hermione gets all weirdly nosey about the Chamber of Secrets. To be honest, I’m surprised McGonagall entertained her questions for that long. Off-topic much? Let’s get back to making rat cups. As you probably remember in Chamber of Secrets, Harry was suspect number one when all those students started getting petrified by some mysterious assailant. It probably didn’t help his case in this scene, when he is wandering around by himself at night (legitimately though do no other students walk around in this school?!). During his fun little walk, he stumbles upon another petrified student and thinks the best course of action is to weirdly graze the guy’s hand. Super weird, but even weirder that Filch just haaaappened to be around the corner and find him. Anyways, that scene appears to have also been filmed at Durham Cathedral. I couldn’t find a clip for this one, but in Chamber of Secrets, shortly after Harry sees that flashback/memory of Tom Riddle, he is running around Hogwarts’ hallways chatting with Ron and Hermione about his revelation that Hagrid was the one who opened the Chamber of Secrets 50 years ago. This scene appears to have been filmed in the Durham Cathedral cloister as well. Last but not least, this final scene is well worth mentioning thanks to its significance, although I’m not 100% sure if they filmed it on location. Trust me, I’ve spent a laughable amount of time comparing window shapes and details, but while it looks very similar to the Durham Cathedral cloisters, there are windows on both sides unlike in real life. So, this could have either been a set constructed to emulate Durham Cathedral or perhaps was Durham Cathedral with a pinch of magical CGI. Nevertheless, walking through the cloister of Durham Cathedral yourself will probably evoke memories of this wonderful scene when Dobby is free at last! Any other questions about Harry Potter and Durham Cathedral? I hope you enjoyed this (thoroughly researched) post all about the Durham Cathedral/Harry Potter connection. Let me know in the comments if you have any more questions. I hope you have a magical trip!